Overview: In early January 2005, my wife and I caught a ferry across the Rio Guadiana from Ayamonte in Spain. We were about nine months into a one-year trip that had already taken us around much of the French coast, down through eastern Spain and across Andalucia. We arrived in Vila Real de Santo Antonio in Portugal – the start of our first ever visit to the country. 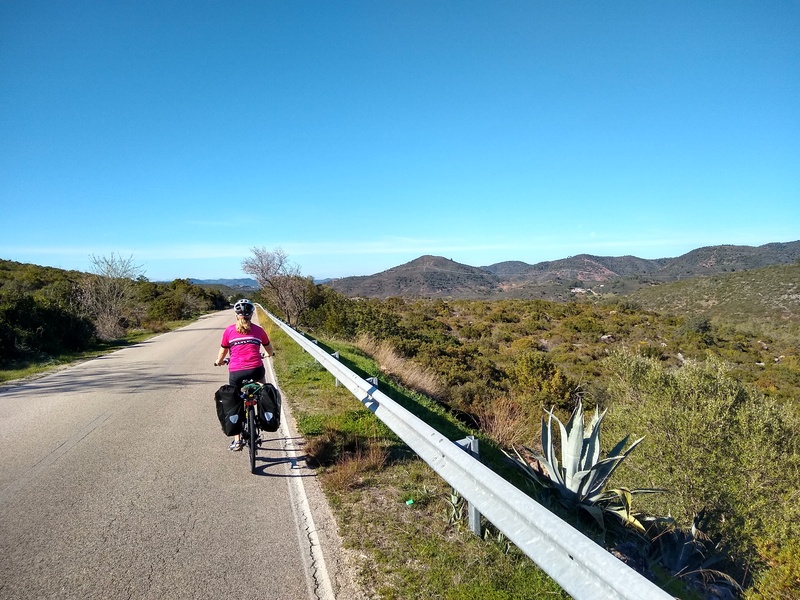 We then spent about two months in Portugal, riding our Trek tandem and towing a Bob Yak trailer from the south eastern corner of the Algarve to the northern border with Galicia. Approaching the border with the Algarve in January. Despite seeming to be against the prevailing wind nearly the whole way, it was a wonderful journey that started our love affair with Portugal. These pages – and the second half detailed under the Lisbon to Galicia pages – describe our route. We were navigating using a Michelin 1:400,000 map of the whole country. This was before Google Maps existed and – as we found out – it is extremely hard (if not nigh on impossible) to find decent maps in Portugal. As a result, our route may not always be the best option. However, having subsequently lived in Portugal for several years, I’ve used this additional experience to suggest alternative and better options where appropriate. See the individual stages for details. 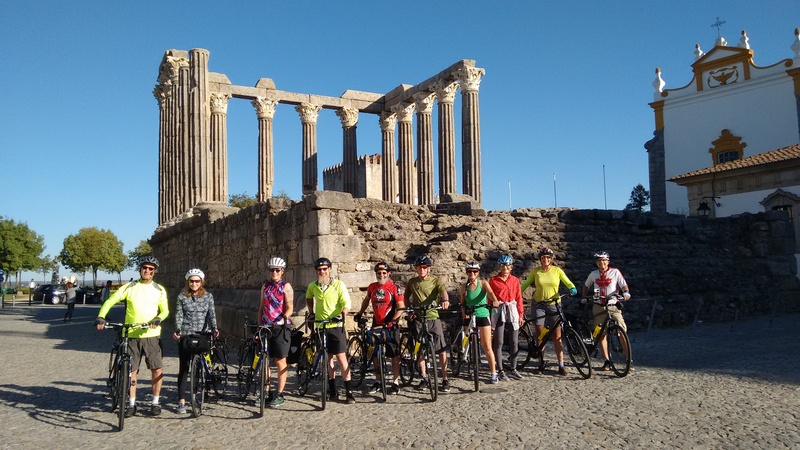 Nevertheless, this was still an excellent route overall and took in much of what makes Portugal special – diverse landscapes, a rich cultural heritage, charming people, fascinating historic towns and villages, sunshine, cobbled roads that shake your bicycle to bits, cheap (but decent) wine, etc, etc. 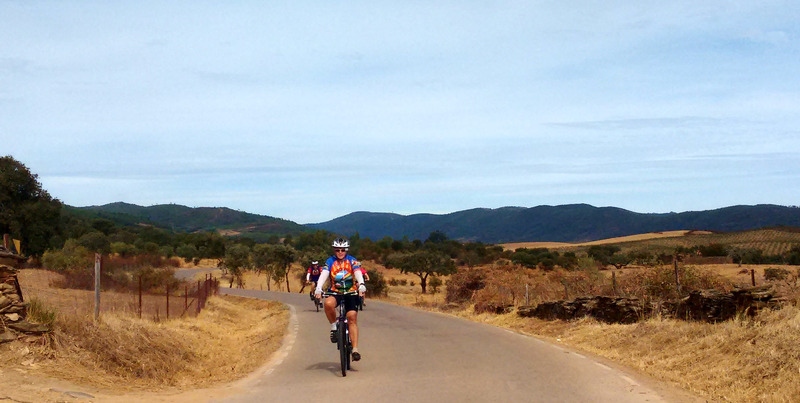 Stages: The first half of our route – begins at Ayamonte just inside Spain. The four stages detailed below took us across the Algarve, up through the Alentejo and back to the coast to get to Lisbon. 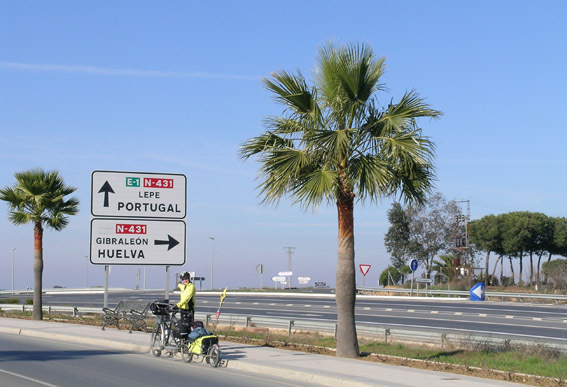 Stage 1: Ayamonte to Lagos – from the Spanish border via Tavira, Loule and Portimao*. 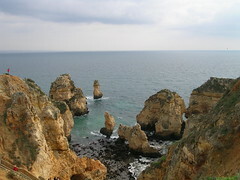 Stage 2: Lagos to Vila Nova de Milfontes– via Sagres, Odeceixe and Zambujeira do Mar. 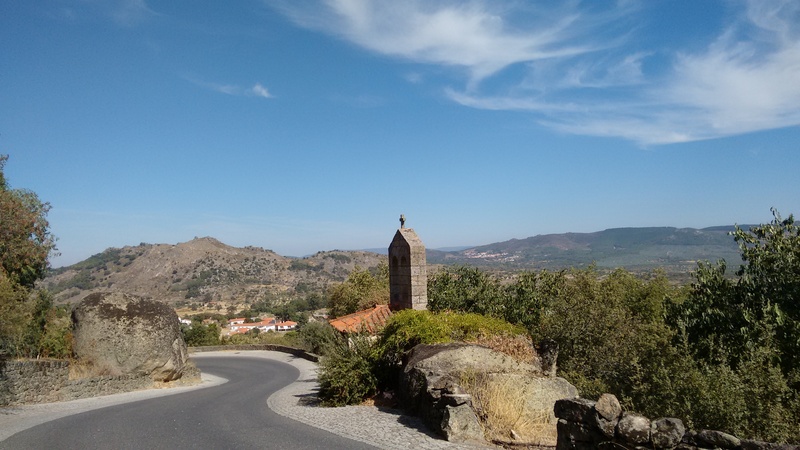 Stage 3: Vila Nova to Evora – inland through the Alentejo to the ancient city of Evora. 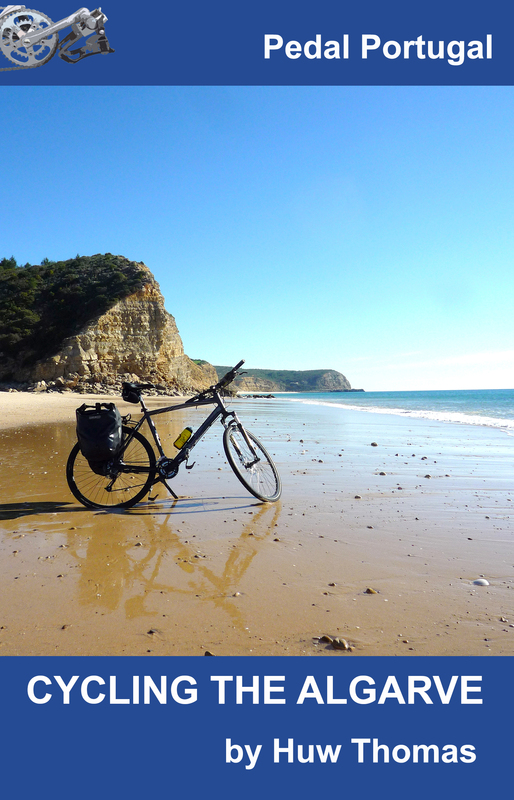 Stage 4: Evora to Lisbon – back to the coast, up the wild Troia peninsula to Setubal and into Lisbon from the south. The second part of our journey took us north from Lisbon to Sintra, Peniche, Coimbra, Aveiro, Arouca, Vila do Conde and Viana do Castelo – before crossing the border into Galicia in Spain. See Lisbon to Galicia for more. *Algarve Cycleway: There is an Ecovia Litoral that is supposed to provide a cycleway across the Algarve but I wouldn’t recommend it. See the Ayamonte to Lagos stage for more info. HI , My fiance and I are looking to cycle through Europe, starting in Libson. We want to go down the coast and over to Spain. We plan to leave in the end of March. We want to camp, workaway, wwoof, couchsurf, anything to save money while traveling. Any advice? Weather conditions? Camping? Routes? Look forward to hearing back!!!! Wow! Where do I start…I’ve done Wwoofing and HelpEx while travelling, plus camping. Routes? Well it depends on so many things – what you want to see, what you don’t want to see, whether you like hills, beaches, towns or what. Hi Michelle, if you don’t already know it check out Warmshowers.org : it’s basically couchsurfing but for cycle tourists…Wonderful comunity! Hi there. I’m pondering cycling your South-North starting around Nov 15th alone. Any advice? Sorry for not replying sooner – been off on a 4-week cycle trip around eastern Europe. Hard to give specific advice without knowing more about your plans. Email me if you have detailed questions. However, one thing I would definitely advise is having either a smartphone or some other access to online maps – the printed ones are very limited and won’t show you all the minor roads. November might be a bit damp, particularly on the coast and in the northern half. I’d maybe suggest doing a circuit of the southern half of the country if you want warmer, dryer conditions.